Like some individuals, Mark Simon, or Pastor Mark as many of us know him, had to deal with a myriad of health and mobility issues for a few years in his life. But most individuals who are struggling to recover from various health issues have a roof over their head — Mark did not. Mark was unable to find a place to live while he was in and out of the hospital, struggling with various medical issues. 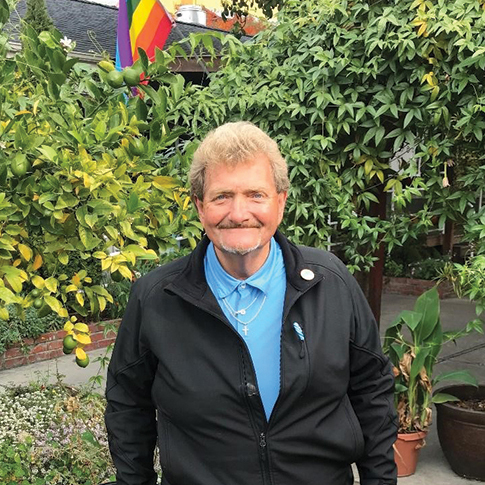 When Mark finally connected with a case manager through Encompass’s Housing for Health program, who referred him to the Paul Lee Loft, Mark was able to find and secure a unit in Santa Cruz. Then the worst happened — his health declined so severely and rapidly, he had to go back to the hospital where they found a severe infection in his spine. Due to being in the hospital for over a month, he lost the lease to his new home. On top of losing his lease, Mark didn’t know when he would be healthy again or when he might find another place to call home. While he was thankful to have the Loft to come back to, he didn’t want to have to use the shelter when he was so close to having his own place to call home. When Mark was finally discharged from the hospital and came back to the Loft, he was determined and motivated more than ever to stay healthy and he was committed to finding housing. This time around, Mark was only in the Loft four months before finding a permanent place to call home.